“The way my new release point and my new mechanics work allows my arm to work freer,” Smith said. Compared to his final start of 2013, which he made with Lowell, Smith’s velocity on his fastball was down slightly in his second spring start on March 20, when he threw against the Rays’ A-ball affiliate in Port Charlotte. Smith, who throws a four-seam and a two-seam fastball, sat 92-93 mph and touched 96 mph in his final start of 2013. This spring, he worked his fastball velocity up from 87-89 mph in the first inning of the March 20 start. He sat 90-91 mph in the third inning, but struggled at times with controlling the fastball. Smith and Lowell Pitching Coach Walter Miranda, who saw Smith last year in his brief stint with the Spinners, said the control issues are a symptom of a mechanical change made this spring to help him locate better. In the short term, Smith still has to get comfortable with the new throwing motion. “I have to get used to my arm being out quicker than I’m normally used to,” Smith said. In the start against the Rays, Smith alternated between missing high to his arm-side—indicating that his arm was flying open and he was releasing the ball too soon—and missing low and to his glove side, which is indicative of him holding on to the ball too long. He eventually found what he called a “happy medium,” and faced one batter over the minimum in four innings of work. He also showed a mid-80s changeup he can locate to the arm side, and flashed a tight slider. Smith said he is also working on a curveball, but is trying to find a consistent grip on the pitch. Spring training, he said, was a good time for the young-armed pitcher to learn. Though Smith threw high-leverage innings and made a few starts in high school and his freshman year at Missouri, he only just transitioned to pitching full-time in 2012. Miranda, who was in Port Charlotte for Smith’s start last week, said the young right-hander is taking to his instruction well. Smith, a Detroit native who signed for $400,000 as a fourth-round pick in the 2013 MLB Draft out of Lee University in Tennessee, was assigned to Low A Greenville for his full-season debut this year. He is not scheduled to be a part of the team’s starting rotation to begin the year, but will be in the mix for starts as the year goes on, likely as he gets used to his re-vamped mechanics. 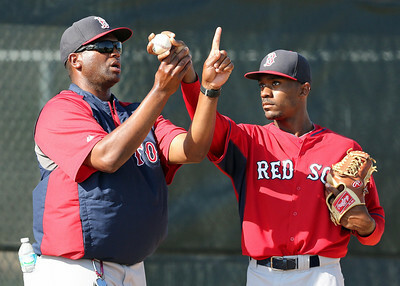 Photo Credit: Myles Smith, right, working with pitching coach Walter Miranda during spring training last month. Photo by Kelly O'Connor.